← tiaras and trianon salutes game 7! In case you’ve forgotten the trés obvious lead-in from the Monday’s post on the French hood] its cross-Channel-cousin was (oh, irony of ironies) the English hood. An angular contraption of bird-housy, geometric sensibilities that seems to imply self-castigation or taking up vows in a strange nunnery. [Now we’re imagining trying to crack one’s neck without popping the shoulder from its socket.) The terms Gable hood and English hood are often used interchangeably, but We broke the style down into more specific categories. The earliest version of the English hood has also been dubbed the Steeple hood. It was popular from the mid-1400s to the early 1500s. Much simpler and [in your Blog Hostess’ opinion] more flattering than the official Gable, the Steeple hood had a simple, pointed shape. Less mutant shoebox and more Big Ben. The face was framed by decorated side panels called lappets and a veil was worn loose behind. The Steeple hood graced the heads of Henry VIII’s grandmother, Lady Margaret Beaufort, and mother Elizabeth of York. The next incarnation of the English hood, the “textbook” Gable hood was worn over several layers of fabric that completely concealed the hair. As the fashion evolved, the Gable hood became a complex construct with a box-shaped back and two tube-shaped, hanging veils. Said hanging veils and lappets were pinned up in the most elaborate ways imaginable. Check out the early version of the Gable on Mary Tudor & Catherine of Aragon (respectively, below left.) It is a gable window. It honestly reminds us of any cartoon where a barnyard animal is outsmarted by an smugger guy in the yard and ends up with a birdhouse on the head. Admit it, you’ve seen that episode! On the right, we see the boxy back and elaborate veil pinnings characteristic of Gable 2.0 as so elegantly *derisive cough* worn by Jane Seymour and then-Princess Mary of Wales. Both Queen Mary and Queen Catherine appear to be pounding fists to the a table for emphasis. What an odd pose to request for a portrait. Whomever did the pinning for young Mary I (far right) certainly let the muses carry them away…yikes. Looks like the Gable hood version of bed-head. At least she wasn’t fist-banging mad back then. courting Jane, the ladies of the court showed loyalties by the hood they chose. French meant you were pro-Lady Greensleeves. Gable made you part of the Seymour clique. The Gable hood’s comeback was slow at first but boy did it revel in glorious revival while Jane Seymour was queen. Courtiers are so bandwagon! Once Jane Seymour died the French hood was back on the head of every English lady at court, being the less hideous of the two. Technically, there remains one last subcategory of the English hood. The Flat hood. This fashion, interestingly is fabled to be an amalgamation of the French and English styles. Stay tuned for tomorrow’s follow up! Or click here if you get here Friday or later. We know, we do feel cheap for stretching this into three posts…well, not that cheap. This entry was posted in england, historic royals, period fashions, tiara time! and tagged english hood, historic fashion, Tudors. Bookmark the permalink. 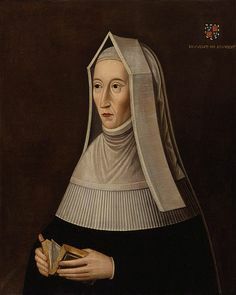 I always thought Margaret Beaufort’s headdress made her look more severe–and fully capable of keeping Elizabeth Woodville in line. It’s a sketch of one “Lady Eliot.” Don’t know who she is save worth using pencil & watercolors on. gah! I wrote this big long reply in the drop-down menu reply and shifted the cursor ever so slightly then–grrr! okay. starting over. First of all, good eye! I don’t know my Tudor artists that well. Which one did Anne of Cleves? Elder or Younger? Now I want to look up that ridiculous gable hood pin-up that Princess Mary is rocking in that second collage.